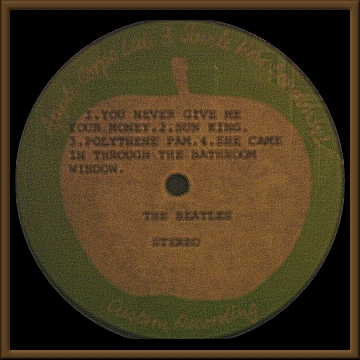 THE SOURCE - Acetates - Apple - "Abbey Road Medley Pt. 1"
This Abbey Road acetate is a 10" one-sided disc. The owner acquired it from a shop in London, now called Intoxica (Portobello area), about 12 years ago. Unfortunately it's not "The Long One/Huge Melody", but quality is exceptional, same sound as released one, but the owner indicates that the strings are different when crosssfading from "You Never Give Me Your Money" into "Sun King". This disc would appear to be sourced from EMI reel E93326. The fact that reel E93328 was a remix of the section described by the owner would seem to corroborate the owner's story about the alternate crossfade. As described by Lewisohn, with the exception of the crossfade, this should be the same as the released mix. [Note: this reel is the first test mix known as "Long One/Huge Medley"